1. 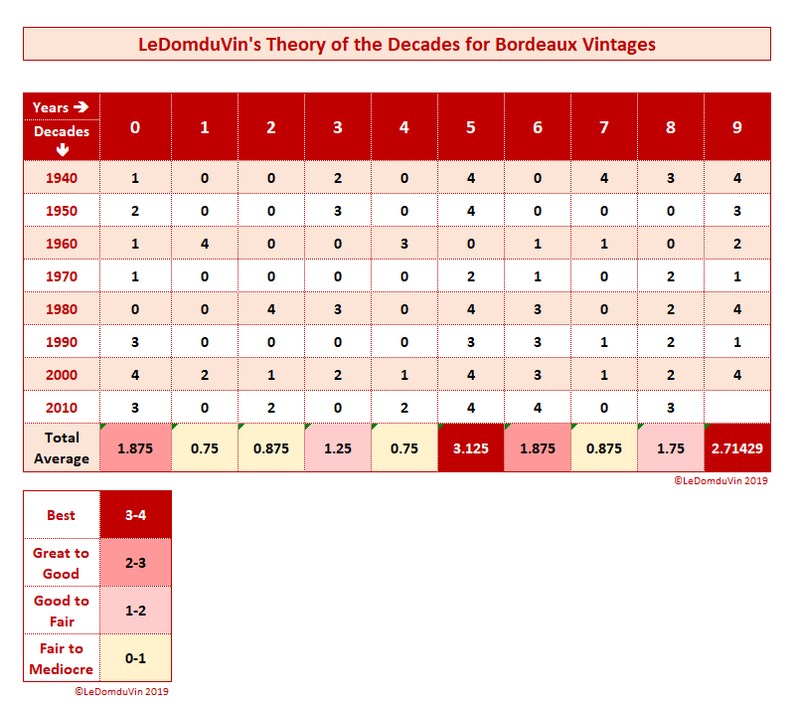 Is there a reliable theory of the decades for Bordeaux vintages? In a conversation with a wine critic (or I could say "colleague", at the time, as we were both working for the same company), Jeannie Cho Lee (*), while attending the 2012 Super Nations Cup Polo Tournament (**) at Tianjin Goldin Metropolitan Polo Club (surely one of, if not "The" best Polo Club in mainland China, read about it here), I briefly started to talk about an old idea of mine, about my theory of the decades for Bordeaux vintages, to have her opinion, but was then immediately reminded to keeping it light (prior rapidly moving to another subject) as boredom started to materialize in her facial expression. Funny enough, every time I tried to defend my theory with producers, winemakers, Négociants, wine journalists or even wine critics for that matter, they usually were either not interested to discuss the subject (granted, it does not make for a passionate debate....) or totally against it, as for most of them, we can't generalize and it is too vast of a controversial subject to be reduced to a simple table (like the one in my illustration above). And I would definitely agree, Bordeaux as a region cannot be taken as a whole and thus the quality of the vintages cannot and should not be generalized to the whole region, but by appellation (at least). And we cannot even say that Bordeaux is only 2 banks: Left and Right, as I already firmly expressed myself on the subject on a previous post (read it here). Yet, I did generalize it, I admit it, but it was for the purpose of simplifying a terribly complicated subject and making it more accessible to everyone. And talking about my illustration above, it somewhat summarizes my theory of the decades for Bordeaux vintages based on my analysis and the combination of results (average and trends) from various vintage charts of both banks from long-established wine specialized sources (e.g. Robert Parker, Wine Spectator, Decanter, Berry Brothers, Wine Enthusiast, etc...). And looking at it, you have to admit that there is a pattern or cycle per decade. Do you see it? It is obvious to me, but maybe it is only me, maybe it is not that obvious to you. In any case, personally, I really do believe that there is a pattern, some sort of a law of the decades in Bordeaux, a vintage quality cycle, which, somehow, repeats itself decade after decade, no matter what... Climate change, global warming, pollution of the air, water and ground, as well as (on a more positive note) better and more accurate technology, better and more natural practices in the vineyard and at the cellar (Organic, Biodynamic, Natural, Lutte Raisonnée, Sustainable farming, etc...) may probably change this vintage quality pattern over the next decade (2020-2029) or two. However, when you look at my illustration, even the sceptic that you are can see the pattern. Is my theory reliable? Well, "reliable" may not be the right word, but it might prove to be correct as it sure does seem rather peculiar to have a "similar" repetition of the superior quality of certain vintages ("years" if you prefer) decade after decade, isn't it? This theory came from my late grandfather. He was the one who first enlightened me about it when I was still a young padawan, learning about the force of Mother Nature while accompanying him in his vineyard and his vegetable garden enclosed with fruit trees. Having lived all of his life in the countryside and being a local winemaker from the Côtes de Bourg, spending most of his time outside in his garden where mingled a “potager”, an orchard and a vineyard, he knew of and had a savvy understanding of the old ways about Mother Nature’s signs to anticipate the weather conditions, as well as the growing cycle of the vines and, to a certain extent, the quality of the up-and-coming vintage as early as early spring. He just had to look at the sky, observe the environment of the vines, the flora and fauna surrounding them (trees, plants, flowers, herbs, insects, mammals, birds, etc… ) and also refer to the cycle of the moon and the sun, to anticipate what will happen. Basically, like most people of the older generations, he still had the instinct (senses and behaviours), as well as the knowledge and the experience to comprehend Mother Nature's signs. The reading of these natural things, that my generation has nearly already forgotten, was his daily routine. And it always amazed me to see him in action. He knew so much about the various natural cycles and signs of Mother Nature, that he could almost anticipate the results and consequences the weather will generate on the vine's life cycle, like if it was snowing, frosting, hailing or raining prior or after this day or this day (meaning prior or after this date or that date), then this or that will happen. Memory is (or "was" should I say) a thing of the old and wise from previous generations. My generation "X" (1965-1979) and the generation "Y" (Millenial - 1980-1994), (and don't even get me started on my kids generations, "Z" (1995-2010 or 2012) for my boy and "Alpha" (roughly 2010-2025) for my girl), don't have any memory anymore, as we rely too much on computers, tablets, smartphones, and other gadgets to remember things for us. Consequently, and sadly, we barely use our neurones and our brain's potential anymore.... (sigh). Do you remember these long opinionated discussions and debates after a movie or even about a book or an exhibition or an event or god knows whatever else you used to be excited and passionate about?... Remember?... Who does that nowadays? Barely no one... Now instead, you only talk about it for less than a few minutes and the interest has already shifted to the next thing... No more long conversation around a drink or two or not even dinner after the movie or the show to talk about it... You just go back to your social networks and posts with selfies and pictures of yourself in weird situations on which you struck a pose that has nothing to do with you or your everyday natural self... giving yourself and more especially others the illusion of a supposedly exiting life that in reality is far from reaching any kind of excitement.... rings the bell? Do you remember the quality time and special moments spent with your family and friends, or even with your kids, walking around, on a stroll somewhere, riding bikes or playing ball games, being outside, breathing the air, having a BBQ, smiling, laughing, sharing, enjoying these precious moments and the scenery (fixed in your brain as an unforgettable memory) without the distraction of your phone coming to life at each notification of all your social network accounts?... Remember?... I bet you don't.... as you are already too used to the bad habits you took with your smartphone over the last 15 years... too bad, these were precious personal moments that you forgot and probably won't relive ever... (if you don't let go at your phone and other gadgets). We do not know anymore how to listen, watch and learn from what surrounds us and more especially from Mother Nature. 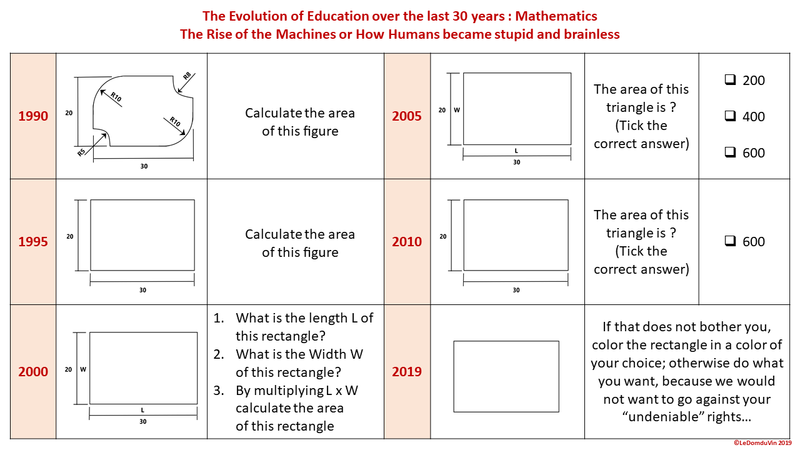 The trend is to rely on the machines and artificial intelligence (AI) to do things faster and supposedly more efficiently, to obtain sterile results often lacking in depth and/or details and often excluding the needed and unavoidable natural and human factors. It seems that communication and entertainment technologies in general, TV and computers then, but more particularly smartphones, tablets and video game consoles (over the last decade), have intensified and accelerated certain bad behavioural processes in our kids and in ourselves too, (let's not deny it), which became bad habits that are more and more difficult to get rid of, as we are becoming too dependent on them, and, unconsciously, even use them as a substitute for our brain. So, I'm asking you, in general, where is the time when people still took the time to observe, comprehend and learn from what surrounds them? And in terms of agriculture and viticulture, where is the time when people had the instinct, skill and/or knowledge on how to pay attention to the natural cycles (the seasons, the tides, the sun, the moon, the stars, etc...) and recognize the signs of Mother Nature? In fact, where is the time when people still had open-mind, curiosity, patience, interest, passion, desire, will, instinct, knowledge, skill and craftsmanship? Is it gone? Will it ever come back? Or would people, from now on, just be satisfied by mediocre results achieved too hastily due to too many screen distractions, as well as lack of interest, attention and/or willingness to do better? Nowadays, we cannot get our eyes out of a screen to the point that we don't even know what surrounds us anymore and we rely more and more on computers, tablets, smartphones, and extremely complicated algorithms capable of calculating, analyzing, predicting and anticipating what will happen with and for anything and everything. Yet, the results are not always more accurate and often falls as statistics or approximate forecasts rather than old school, more traditional and verifiable facts taking into consideration the unavoidable natural and human factors, and thus surely closer to the reality than an algorithm will ever be. And I'm not a progress hater or one of those saying "It was better before" (maybe a little...), as I fully embrace progress and new technologies, as long as they are made and used for the better, and as long as they do not compromise so much the natural part of our life and existence. 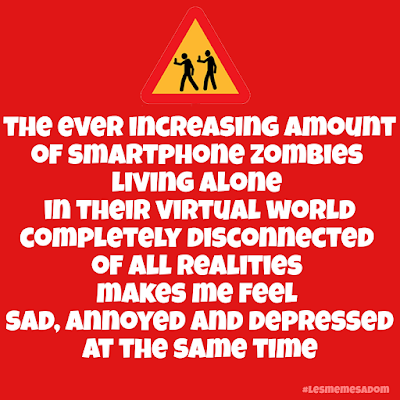 Yet, we know all too well that the time spent on digital screens represent excessive distractions and affect cognitive and social development, especially memory building and interaction skill, for both children and parents. 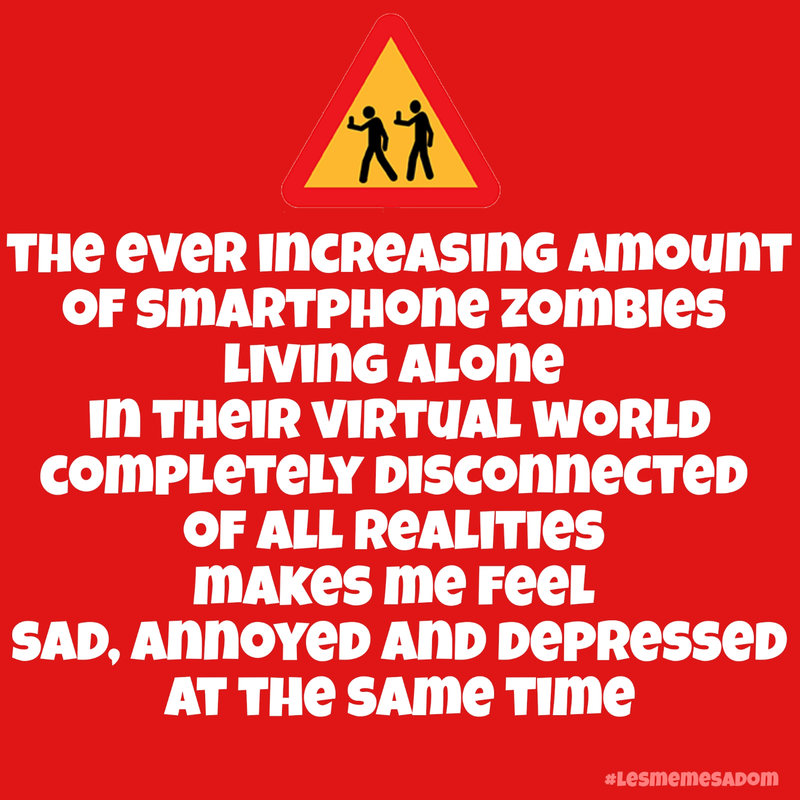 We are basically becoming stupid, brainless, socially impaired and depressed individuals, empty of all sort of desires and wills and initiatives, solely guided by social networks only increasing our loneliness and individualism, addicted to lobotomizing games and unable to communicate with each other anymore. All I'm trying to say is that it is saddening to realize how disconnected from reality and even more from Mother Nature we have become. The generation of my grandfather, especially for those who lived and worked in the countryside like him, knew how to recycle and live with Mother Nature and somehow better protected the environment... I remember when I was young, back in the late 70s, and in the 80s, my grandfather already had different recycle bins: glass, metal, paper and a pit to compost the rest of vegetables and shellfish and molluscs. He had most of his vegetable and fruits coming from his garden and was buying whatever else he needed from other local farms or local artisanal Boucher/Charcutier and Boulanger/Patissier of the area. He always had a basket to do his groceries, no plastic bags (or very rarely, but he recycled them too). And I could carry on and on with many more examples. Yet, on the other side of the coin, let's not forget that back in those days the use of harmful chemicals in the vineyard (both herbicides and insecticides) and within agriculture, in general, was common practice, as production was still about quantity, not quality, back then. In fact, Mother Nature has been disrespected, soiled, damaged, polluted, asphyxiated, mutilated and overall disturbed in her daily work for the past 8 decades (since WWII, at least) by the unavoidable human factor (which definitely has something to do with that disturbance, despite the belief of some sceptics who still believe that humans have nothing to do with it). Yet, I'm also trying to say that the human factor can also contribute to help Mother Nature when used the right way and for the greater good rather than to serve evil or vile interests. The recent comeback to more natural practices in agriculture, and more specifically in viticulture (Natural, Organic, Biodynamic, Lutte Raisonnée, etc....) is a proof that we are maybe witnessing a new age of reason for a small, yet ever-growing, community of concerned souls that are willing to change things to save our little planet. The law of the decades for wine vintages is one of those facts, resulting of a lot of patience, watch-attentively-and-learn type of attitude and more especially careful attention to the various patterns and cycles of life in general. And that process can be applied to a lot of different things in direct relation with nature and its various cycles, not only wine vintages. Of course, this process of predicting or anticipating the quality of the vintages via years of experience and in-depth knowledge of the specific climate which characterize a region and its Terroir, combined with info and data collected and analysed over the years, has to be applied to a specific region where enough info and data about the vintages have been recorded and the wines tasted to really be accurate. You cannot generalize or apply it to a country, for example, too many variations. It has to be done on a smaller scale, at "Region" or Sub-region" level to have a general idea, but better at the "Appellation" level to be more precise. 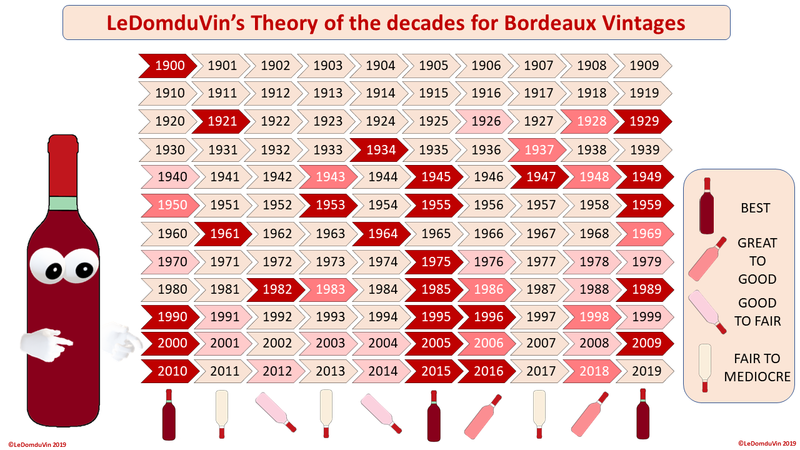 For the exercise of this post, as it will be too complex and tedious to apply this theory of the decades at appellation level, let’s just apply it to the whole region of Bordeaux over the last 80 years (1940 to Present). I can hear you say already: "It is too vague and too general"; I agree, but it will have to do for this example. 1. It is where I come from and where I grew up with my grandfather, and therefore is the place possess the most knowledge of and personal references too. 2. Bordeaux is also an easy target as it is probably one of the most (if not "The" most) coveted and documented wine regions in the world, covered by a countless amount of media on daily basis, and therefore where the most info and data about the quality of the vintages can be found. 1. Is there an obvious pattern on the quality of certain vintages when looking at the decades (on the illustration above or the table below)? 2. Could a pattern or cycle in the local climate and weather explains why or be the reason why some years are better than the others? 3. Are the best quality vintages/years the same every decade? And if yes, what are these vintages? The theory (or "law") of the decades for Bordeaux vintages consists on analyzing the past decades and establish if there is a pattern between certain vintages/years, like a recurring result in term of quality and production of the wine characteristic to certain specific years, decade after decade; almost like an unavoidable life cycle that could not be countered or changed, but rather anticipated because of previous characteristics, signs and patterns from the studies of earlier vintages and decades. As the idiom says: "A picture (or visual) is worth a thousand words", and that is why I created the illustration above, for, at first glance, anyone can easily see the quality of the vintages within the decades from 1900 to present. The quality differences between the vintages (for Bordeaux wines as a whole region for the purpose of this post) have been highlighted in 4 different colors to make it more simple and easy to read and understand. Do you see the pattern now? No? But you have to admit that the vintages in "Bordeaux" color form (somehow) a column, and therefore form a pattern, no? Let me explain my theory with a very simple table chart with numbers, people like numbers to verify a theory, so let's do it with numbers, which will be more visual and easier to understand at one glance. The following results are not solely based on my observation and combination of various wine critic’s ratings. They also include memories of what my grandfather used to tell me about the quality of these vintages, as well as what I witnessed and experienced myself when in Bordeaux, mingled with all the Bordeaux wines I tasted myself over the last 28 years of my career (as a well seasoned and travelled Sommelier and Wine Buyer, working in the wine industry for restaurants and wine retail stores on 3 continents). Consequently, these results represent more a reflection of my unique point of view and opinion about the quality of certain vintages, combined with the wine critics and press scores, rather than being, solely, specifically or exactly, an average of the critics and press scores. Some people may still not see it or admit it, but there is somewhat of a pattern in my illustration above, a pattern clearly shown and proven by the results in the above table. Numbers don't lie, they are facts. I also can hear other people saying that it is difficult to draft a table like this one, as the climatic changes that occurred over the last 30 years, as well as new technologies and methods in the vineyards and in the cellars, need to be taken into consideration as they have influenced the quality of the vintages too. And therefore, this table is too generic or general and shouldn't be applied to the whole region of Bordeaux but rather to specific appellation to be more accurate and consistent. And I will say yes, I hear you and I agree with you. You are right, it definitely should be applied to a more specific appellation to be more accurate and consistent. However, this is just an example for the people that never really thought of doing such an analysis or comparison before (and it would be too long and tedious to apply it to specific appellation). So, to somewhat resume the 3 tables above, and if we take Bordeaux as a whole and solely in terms of vintage quality, it seems that the vintages ending with 0, 5, 6, and 9 are pretty reliable and fairly consistent in general, with 5 and 9 being usually the best (despite a few exceptions); while the vintages ending with 1, 3, 4 and 7, in general, tend to be less reliable and/or consistent and to say the least of lesser quality. Thus confirming my theory of the decades for Bordeaux Vintages by the undeniable existence of a pattern. The vintages ending with "2" are mixed, and despite 1982 which was a great vintage, and 2002 which offered great bargains for the quality, the rest were not that good. And 2012 confirmed it, good for some appellations, but mostly fair for the others and overall better than 2011 or 2013, but still not a great vintage. The ones ending in "8" are also mixed, but usually better than ending "2", with good to fair vintages like 2008, or even Great to good vintage like 2018. Some of you may be surprised that I included 2003 as a bad vintage. Well, in my opinion, despite a few distinguished effort from a few Chateaux, and I was there in Bordeaux for the "En Primeur" campaign, tasting more than 1000 wines from both banks for 8 consecutive days (some 3 or 4 times over the week in various tastings), and I can surely say that 2003 was the less homogeneous vintage I ever tasted in my whole career. It was all over the place, no consistency and no charm, with combined overripe fruit, weird acidity and green tannins. I already wrote many times over my views in various previous posts and the reasons why this vintage tasted the way it did. (You can read some of my point of view regarding the 2003 Bordeaux Vintage on my previous post here and here. Obviously, as I was saying earlier, this is very general and can easily be discussed and disputed; however, there is a pattern, and now you cannot say the opposite. And I found that fascinating. It makes you think twice, I’m sure. Try to apply it to a more specific region, and not necessarily Bordeaux, but also Burgundy, Loire, Rhone, Languedoc, Rioja, Ribera del Duero, Piedmont, Tuscany, Napa and everywhere else. You will see it is very interesting. Of course, certain mountainous vineyards and regions, where the weather is less homogenous due to fast and drastic changes in temperatures and humidity levels (and overall climate), are less likely to show this type of patterns. This type of decade's tables presenting a vintage quality chart is definitely more adaptable to regions where the climate is rather temperate, fairly homogenous and consistent, and roughly the same and not presenting too many extreme differences from one year to the next. They show that, over a certain period of time, things usually revolve around similar axes and patterns, coming back or reappearing as a recurring factor after a cycle of a certain amount of years. 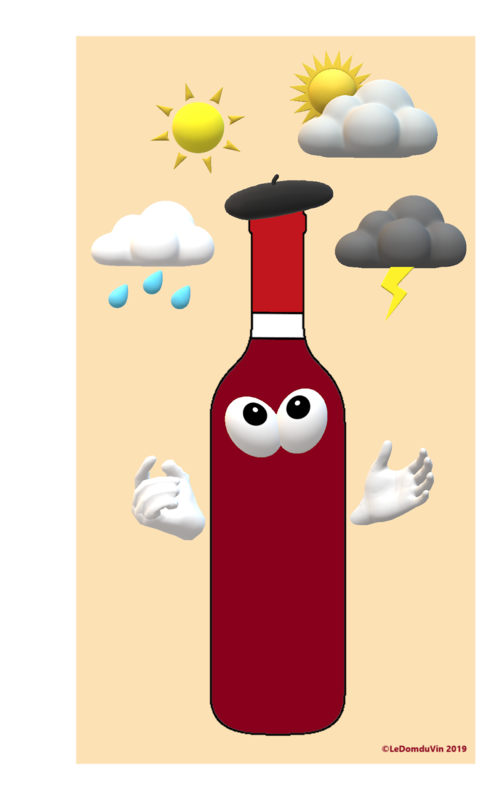 For this example, we are talking about decades, basically what happens every 10 years (or so) in terms of weather conditions, climatology and the resulting quality of the vintages of a certain designated area (the whole region of Bordeaux for this example). Atop of the reasons already cited above, the other reasons why I took the region of Bordeaux as a whole, and not by appellation, are that each appellation includes numerous microclimates and other factors, within the appellation, which can greatly influence the vintages and thus could challenge this theory. For example, the microclimates within the appellation depend mostly on their proximity with the Gironde estuary (the Haut-Medoc on the left bank and Cotes de Bourg/Blaye on the Right bank) and/or the two rivers flowing into it La Garonne (Graves, Sauternes) and La Dordogne (Saint-Emilion, Pomerol and the rest of the appellations of the right bank) and the Entre-Deux-Mers in between. Therefore differ greatly from each other. Also taking Bordeaux as a whole allows for preventing from getting too much into details, for example, the fact that the Left Bank is rather flat, with isolated small hills and gently inclined slopes, and therefore more exposed to wind and rain from the Atlantic and also subject to higher humidity into the soil. While the Right Bank rests on a limestone bedrock plateau extending from the Côtes de Blaye to the north and descending all the way south to the Côtes de Castillon, undulating all along with rounded hills creating a totally different (and much attractive, I must say) landscape than the Left Bank, with more microclimates and variation of temperatures (than the Left Bank). Consequently, all these factors create numerous microclimates and niches where temperature and humidity may differ from Appellation and/or even Chateaux next to/near each other. I also could have taken into consideration the tremendous works and efforts, deployed over the last 15-20 years, into the vineyards and the cellars from the Chateaux owners and winemakers, in addition to new techniques and technologies, to produce better wines, thus increasing both the quality of the wines but also the vines and their environment. But their again, these are very influential factors that will have challenge the theory. However, this last point, about new techniques and technologies applied in the vineyards and cellars, is a bit controversial, because some of the best wines of Bordeaux are now produced by people who leave Mother Nature do what she does best in the vineyards and adopt a minimalist attitude and approach in terms of interference with the winemaking part in the cellar. In any case, all I'm trying to say is that I tried to do it at appellation level and in my opinion it is more difficult due to the many influential factors cited above... but not impossible. Yet, you never know... As, 2009, for example, was considered lost as two hail storms in May 2009 (first on May 11th and the other on May 13th), which destroyed thousands of hectares on their paths around the Côtes de Bourg, Premières Côtes de Blaye, Margaux, Graves, but most predominantly around St-Émilion and the Entre-Deux-Mers, with stones the size of ping pong balls, but ended up becoming one of Bordeaux’s greatest vintages of this decade. So, we will see, as per my table and my theory, 2019 should be a great vintage (like most vintages ending in "9", except 1979 and 1999, which were bad vintages overall). Going back to the discussion with Master of Wine, Jeannie Cho Lee, she was even expressing the very interesting idea to see if my theory could apply to the Chinese calendar, which is not calculated by decade but by dozen of years. I think that it is a good idea too. The use of 12-year animal cycles for recording the years in China dates back to 100 A.D. Each year is symbolized by an animal and the 12 animals are mouse, ox, tiger, rabbit, dragon, snake, horse, goat, monkey, rooster, dog and pig. We could even push the idea to apply it to the biodynamic calendar and moon cycle to see if instead of days, there could be "Root", "Fruit" or "Leaf" years too. As I was saying at the beginning of this post, this theory is just an idea, a concept, an ancient way the older generations used to have, when computers and algorithms were not there to do the job. Climatologist and meteorologist are surely very interested in this type of experience. And Oenologists and Winemakers must also have a sense of this theory and even reminiscences of this lost instinct of relying on Mother's Nature signs; more especially the ones working with Biodynamic, Organic, Biologique, “Lutte Raisonnee” and other natural winemaking methods. However, no matter what you think about my theory, I wrote this little post in memory of my late grandfather and his way of doing things (*****), which is for me the old way, the old school way, the way that I personally would like to go back to, especially now with my kids. When things were important and had a reason, a purpose and sentimental value. Because our generation should take and make the time to understand, watch and learn Nature, the environment and our everyday surrounding, rather than destroying them by not paying attention anymore and pass by without seeing or even thinking about these important things that are still all around us and on which we relied on for centuries, but that we do not know how to see or feel anymore. So, let’s retrieve this lost instinct and act to save our little planet now before it is too late. That's all folks for today, hope you now better understand which point I was trying to make with my Theory of the Decades for Bordeaux Vintages.... and stay tuned for more posts coming soon (old revisited posts like this one or brand new ones). Enjoy! Santé! Cheers! and as always Thanks! for reading my post.